here at serimony, we've been slowly but surely updating our website, and today finally posted some of our recent custom wedding invitation designs. Congratulations to Dominique and Todd, who got married last month in Arizona! They were looking for a design that conveyed the colors in the desert, but also had a luxurious feel. 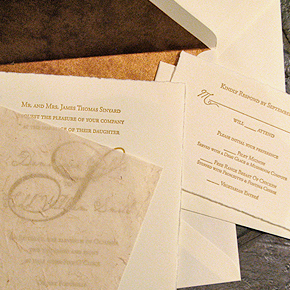 We worked together picking out papers and fonts and colors and came up with these gorgeous letterpressed invitations.